Creative Mornings was amazing this morning (sign up for their emails! ), it was focused on community and the gals from The Coven, which is a collaborative community and co-working space. Their business plan originally came from a place of anger because of the political / social climate in 2017. Andrea Jenkins told them, "If you're going to burn something down, you need to build something in its place." The plan totally changed to a place of joy, building community, and unapologetically standing up for their values. The Coven has a 5-for-1 membership program. For every 5 memberships, one is donated to a woman / non-binary person who is in a community that would otherwise be not well represented. Think communities of color, people with disabilities, single mothers, etc. This is in place so it's not just rich white women who can afford a membership and it keeps the community representative of the actual Twin Cities community. "People want to be seen, heard, and validated." "We don't want you to feel like an 'only'." "Everyone is better when everyone is better." The Coven is a for-profit business but is very socially and community minded. Men can donate money for a woman's or a non-binary person's membership, anyone can donate to their cause, and I think you can check their place out if you ask. Here's their contact info! Facebook x Twitter x Instagram and their website. I loved going to this FREE event hosted by Creative Mornings (seriously, check them out) and loved meeting new people in my community! The next event will be hosted on Sept. 21 by a local artist named Ashley Mary Barlow. For me, lipstick has always been so fun. I love trying different colors and brands, it’s such an easy way to completely change your mood and look for the day. The only thing I don’t like about lip color is how it transfers onto other things – your food, your loved ones, the rest of your face. The three lip products I’ve chosen to review are LipSense in the shade SheLaLa, NYX High Voltage lipstick in the shade Twisted, and Revlon ColorStay Overtime in Ultimate Wine. This review is not sponsored, I paid for all of these products and I am in no way a makeup professional. I just dabble. Application: I waited until I was at work and seated at my desk to apply my lip ‘look’ today. LipSense needs to be applied with a PROCESS - there is no way I’d apply this on the bus or in a car. I read in a review once that this was “the only lip product you need a PHD to apply.” Obviously an exaggeration…but not far off. LipSense requires you to apply three layers of color plus gloss. First, you’re instructed to clean your lips and dry them - I normally just wipe them with my fingers and I haven’t had a problem (real life here, y’all). The color needs to be shaken, then the doe foot applicator needs to be wiped off so the excess product is removed, and THEN you can swipe on your lips - but you need to apply in the same direction each time as to not remove the previous layer AND stretch your lips taut as each layer dries so it doesn’t settle into the lines of your lips. Tired yet? After applying 3 layers, you then need to apply the gloss to ensure the color stays on your lips, then you can press your lips together. You basically need to have your mouth open with your lips stretched and have hands as steady as a cake decorator for a few minutes to assure yourself an #onpoint lip. There is a slight burning sensation as you apply your color. LipSense says that it uses cosmetic grade alcohol, so that’s probably why - but I ask myself if it’s really necessary that my makeup hurt me when I apply it. Fair warning: LipSense has a SMELL. It’s potent at first and fades away a bit as you go on, but the chemical smell lingers. Do not buy this if smelly makeup bothers you. The lipgloss feels hydrating and covers the stickiness of the color. I think it doesn’t have a scent, but can’t tell since the color has such a strong odor. Once the gloss sinks in, I stopped messing with my lips so much. The gloss sinking in makes your lips a little tacky, but I’ve eaten an apple at this point and didn’t cut it up and the color hasn’t budged. The color crumbled up at lunch a bit around the sides of my mouth and on the waterline of my lips, but I had only reapplied the gloss once since I’d applied the color. That middle left photo is after I’ve eaten chips and shrimp scampi leftovers, all while drinking water all day. Not bad! I had to run home to do some errands and I was not able to reapply the gloss. The color started to recede from my inner lip line and dried out considerably. Gloss is really the key in keeping LipSense indestructible. When I removed it with the brand’s ‘Oops remover’, I left the product on for about a minute so it could soak into the LipSense. My tactic worked for the top lip, but I had to scrub my bottom lip, which left it sore and dry. When I woke up the next morning, I could still see where the LipSense was. This stuff doesn't mess around. Claim to be long lasting? Yes, there’s a whole spiel and it's seriously impressive: “This unique product is waterproof and does not smear off, rub off, or kiss off and can last anywhere from 4 to18 hours. LipSense is a non-wax, liquid lip color that stays on the skin and provides a natural, mechanical shield from the elements.” - senegence.com/SeneSite/SeneGenceProducts. Does it transfer and fade? No, as long as you reapply the gloss. The gloss gets on things that your lips touch, but I think that’s to be expected. This stuff will not transfer, even after rubbing your lips with your fingers. Reapplications from 8 am - 5 pm? No color reapplications, 4 gloss touch ups. Point of purchase? I am friends with a SeneGence makeup independent distributor – LipSense is only available through independent distributors, like LuLaRoe and Mary Kay. A color alone is $25, but as we all know by now, we need the gloss for the color to stay - the gloss is $20, and the remover is $10. A total of $55 without tax and shipping. I like LipSense but it has its downfalls. How is it staying on my lips for so long? Also, it’s pretty pricy for me at $55 to get started with a single color. Depending on your distributor, you could potentially swap a color you don’t like - but that means more money for shipping. All that said, this stuff is basically bulletproof and I can count on it when I know I want color on my lips but also need to do things but can’t reapply or bother with mess. Application: I started with a cheap pink lip liner that I got from H&M some time last year - I always find that my lipsticks last longer with some kind of base. When I applied the NYX lipstick, the color stayed true to what was in the tube, it didn’t mix with the lip liner, which is what I was expecting. It had a creamy consistency, no real smell, and felt hydrating on the lips. I don’t know about you guys, but when I wear lipstick that I know will transfer, I hold my lips in a different way and act in a different way. I’ve been known to sip water from my Nalgene with a disposable straw before. That’s sort of how the first few hours went. To make this a fair review (and also to stay hydrated), I forced myself to start drinking water out of my bottle (without a straw) and had some tea from a teacup. The lipstick transferred to the containers, but my drinking and usage didn’t seem to affect the color at all. Staying hydrated AND colorful? Bonus. When it came to lunch, I had half a sub sandwich. The color definitely transferred to the bread, but I didn’t taste it and also didn’t mind how the color looked on my lips after it had faded. I reapplied and went on with my day, which included walking to other businesses and asking if they’d hang up a promotional flyer for our event. I got tons of compliments on my lip color, which is always fun! As I was walking around, I stopped to get an iced tea - with a straw. I noticed my lip color on the straw, but as I had found earlier in the day, it didn’t fade. I started to remove the lipstick with a paper towel and it really stuck to my lips. I ended up wetting the paper towel to remove it a little better, but noticed that the lipstick had stained my lips. The stain had no transfer and after a couple hours, dinner and normal no-lipstick activities, my lips were back to their normal color. My lips were not dried out by this product at all. Claim to be long-lasting? No. Does it transfer and fade? Yes, and it bled a tiny bit. But I like how it looks as it fades. Reapplications from 8 am - 5 pm? One, a simple swipe. Point of purchase? Target, on clearance - I believe it was under the $2 mark. The lip liner I used was probably a dollar. Hey, big spender! I enjoy this product a LOT. It’s a pop of color that makes me feel happy, it fades away beautifully through the day, has no smell, and the whole ‘kit’ was well under $5. Fantastic quality, especially for the price point. Would recommend. Important to note – I believe this lipstick is now called “Turnt Up!” instead of High Voltage. This is a two part product: color and gloss. They’re sold as one wand with two twist off sides. This product was easy to apply. The color applied very wet but dried down quickly, then I added the gloss and it felt moisturizing. I’m not sure if the LipSense from yesterday left my lips dry, but when I added gloss I could feel some texture on my bottom lip. Overall, easy to apply. Today I gave blood, so I was snacking and drinking water and juice the whole time I was at work. ColorStay Overtime feels a little tacky, but not annoyingly so. I think the texture I was feeling before was either the tiny pieces of glitter in the product or the product wearing off on my waterline. I barely noticed that I was wearing anything on my lips, and the red showed minimal wear. I wasn’t focused as much on my lips today, so maybe I would have reapplied on another day whereas today I just let it go. I left it on the rest of the day and it was feeling a little dry and tacky at the same time (how is that possible? ), so I took it off. The lipstick comes off completely with makeup remover - awesome. I will say that I don’t love the glitter in the product. Does it transfer and fade? No transfer, fades a little but not so bad. Reapplications from 8 am - 5 pm? One gloss. I found this in Target for $8.59. Lots of colors, super easy and accessible. I think this stuff is great. It definitely holds up agains LipSense - this does basically the same with no annoying smell, no stinging and all at a fraction of the price. Happy first day of Autumn! I can't think of anything better than the start of a brand new season. It's a new day, it's a new season, begin again. Right click, print, & color away! Tag me on social media if you use them, I would love to see! Helloooo! Today I have exciting things to show you guys, our new identity for A11 Design! For a graphic designer, making your own brand is one of the most exciting and daunting things. It's so exciting because you can design and create without limits to exactly what you want, but that's also the hard part. Endless possibilities! I decided that I just needed to jump and do something since there were so many options. I can always change it later, right? It's a never-ending process, but I love it. My current brand identity is nature based, but with a fun twist. I'm in process with some business cards, hopefully coming soon! Thanks for stopping by, guys! I've taken a few meditation and mindfulness classes, but I've never been able to stick with it as a lifestyle. While I was scrolling through Instagram yesterday, I found someone asking for apps that would help her practice mindfulness every day. A very common suggestion was an app called Stop, Breathe, & Think. The sheer amount of suggestions to download it made me search for it in the app store, and I was pleasantly surprised by the design of the app. SBT is playfully illustrated with neutral pleasing colors. It explains thoroughly (but kindly) what mindfulness is and you can either go through a mood self evaluation or you can go through a list and pick a (FREE) meditation right off the bat. I haven't looked into the organization who developed it, but they look like a solid cause. 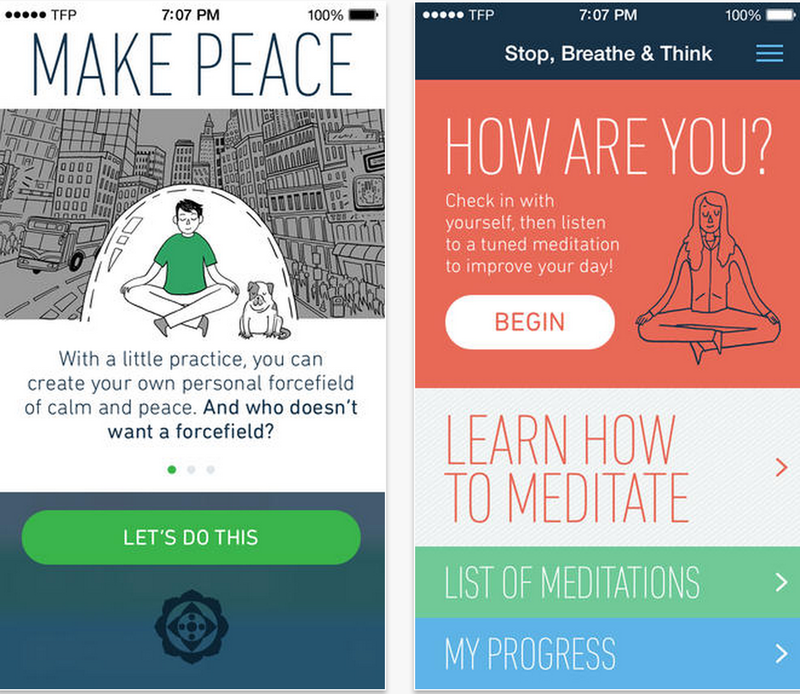 The app is free and you can download up to something like 7 extra meditations for 99 cents to $2.99. It's a fantastic app. BASICALLY, if you have ever had any interest in meditation or mindfulness, DOWNLOAD THIS. Screenshots below are taken from the iTunes store. All the brave, crazy people out there who also work as camp counselors know that some kids are just a vocalized stream of unedited thoughts. Some of the kids this summer were perfect examples, as listed below. My lovely co-counselor for the last 3 weeks of the session is Australian. She has some different words for things: chewing gum is chewy, tennis shoes are runners, and swim suits are bathers. The list goes on and on, but the one that got the most reaction from the kids was that flip flops are thongs. She would say how she loves her thongs and wears them constantly, and you could pretty much see the kids' eyes flashing with, "OMG?! WHAT DID SHE SAY?" Mostly they just giggled and went on with their day, but one girl in particular was a little more concerned. Here's how our conversation played out. call flip flops....um.....something that girls wear." me: Thongs? That's not a bad word, you can say that. camper: "Well they're just really weird underwear." Every week we start off with general camp and cabin rules. We cover the buddy system, wearing shoes, how to ask to go to the bathroom at night, being respectful of others, and just the basics of being a good person. One of my little campers decided to make up her own cabin rules, which you can read below from the photos. I have been working at summer camp for the past 3 months! It's a camp for children whose special social, economic, or medical needs might not otherwise allow them to enjoy a summer camp experience. For the most part, I have been there and working with children every single day. At the beginning of each summer, the counselors have a training week. During this training week, we decorate the cafeteria to fit the theme of the camp season. This year, our theme was "Wizards and Warriors." I have made 'find your new name' boards for the cafeteria each year that I've worked for this camp, and this year is no different. Check out the board and find your own wizard or warrior name! When I studied abroad last semester, I bought a little cactus to bring some more color, life, and home-y feelings into our apartment. This little doodle is dedicated to my tiny Roman cactus friend. At any given moment, I'm probably laughing at something that happened 3 days ago.